One can never be sure, when sauntering into the Gold Street Gossip Shop, watering hole to the gentry, quite what the plan will be. Will the jammers, in the spirit of inconsistency, play some jazz? Will Madge from Altona run amok, or sit out the back with a house port, a sailor, and a catering pack of Winnie blues? Will Hortense get lucky, always assuming she will be there, which she might be? The Castlemaine Jam Session: Free beer at bar prices! It quite escapes me why we are promoting this – Ken Turnbull seemed keen, and why not are the main reasons that come to mind. 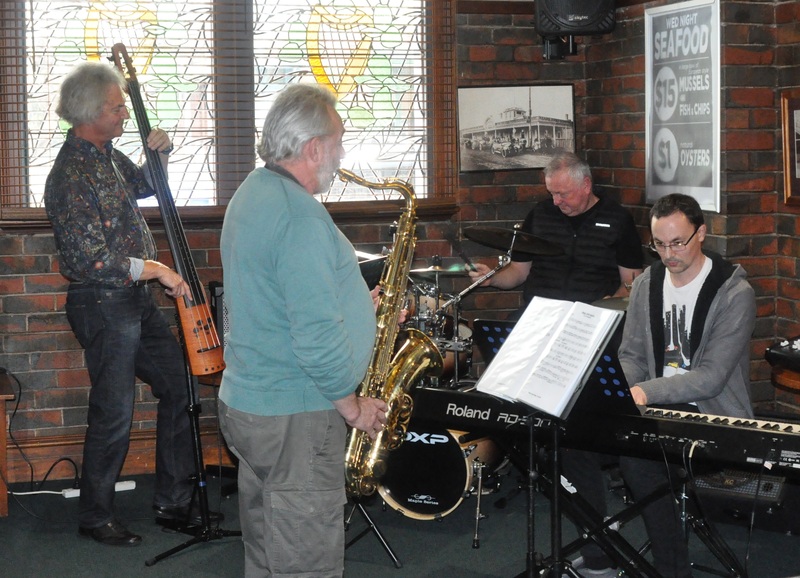 The Castlemaine Jazz Jam, originally promoted by the Jammers to provoke interest in the Jazz Festival, is on its way to becoming a local institution in its own right. You might like to consider a jolly up the Calder on October 2nd – the first Sunday of the month, and a quick polish of the chops with the local musos. Tends to get more of an audience than the Melbourne Jam, and plenty of playing time. You can always come back to the Lunatic Soup Lounge and Gossip shop the following week, and tell us all about it. gets you all the details. The jazz jammers’ weekly report is too nice these days. Govt. are caring and sharing . Last Sunday’s Jam was the third biggest turn out of musos we have ever had. Props to Rod and Bette back on a brief trip from some sweaty dive north of Borneo) for dragging so many through the door, and sorry you had to shout all afternoon to maintain the constant banter to which you are accustomed. THE BLUES Probably the most basic influence on jazz, comprised of no more than three chords and the perfidy of women. All of it sung with a fake sincerity, often in a fake American accent to make it sound authentic. Apparently. JAZZ STANDARDS The term is an ironic one, describing the constitutional inability of your average muso to play the same thing twice. There are actually few standards amongst Jazz Musicians, and all of them are low. Jazz standards use four or even five chords, and were written some time between 1933 and1948, a time when most sensible people would be staying home to watch the advertisements on pay TV. The genre is defined by the use of walking tenths in the bass line, or staggering quarters if the bottleshop will still give you credit; and by the soloist swinging – preferably from a rope attached to the rafters, but I digress. BEBOP Another ironic term, describing the constitutional inability of your average bebop muso to play the same thing once. If you slow it down and play Bebop backwards, it doesn’t sound any worse. Spooky, or what! POST BEBOP This genre cannot be called ironic at all, as most adherents struggle with words of more than one syllable. It does not refer to jazz music that has been learnt by mail order. No one has ever listened to the end of a post bebop composition – because it doesn’t have one, it just fades away when the jazz club goes broke. FREE JAZZ Jazz that is so dissonant and repetitive that no one will pay for it. The entire enrolment of University Jazz Courses is said to be working on extending this to the point where people will pay for it (on condition that it stops immediately.) If successful, they will be able to go and get a job teaching trombone in a High School one year earlier than the previous intake (see note below). Progress is a wondrous thing. SHOWTUNES Ah, the most sublime music of all – saccharine romantic ballads. Showtunes have a timeless quality, at least when played by the Jammers, and we only pick them to see if we can get Colonel T off the stage. Footnote: The enrolment at a University is called an intake. Each year around Melbourne about 100 Students are taken in by Jazz courses. Only to discover that there are no jobs at the end of it, other than teaching trombone in a High School. Far better to have studied Accounting or Quantity Surveying. There are no jobs in those disciplines either, but at least the pay is better. Carruthers has, apparently fixed that, and now the jams are almost too damned noisy instead. Last week saw a mixed bag of trophies pinned to the ancestral walls of the mouldering pile, and we will skip, figuratively, over the opening salvo – a piping hot set with Sam Izzo at the keys – and get to the guts of the matter, which was the sight of Il Duce twinkle toeing across the dance floor to tell the five, read it and weep, five saxaphones to shut the f*** up. Messrs Chaos, Cardinal Calamatta, Alan West, Tony and Laurie Savage were the guilty parties. Please please put to your list very very good professional jam session at the 303 in Northcote every first and third Monday of the month, 7.30 start. Please let all musicians and jazz musician about this great jam which is run by very good young musicians ex students from VCA , Melbourne University and Monash University. Only one gig in September for me! It will be at Farouk’s Olive at 711 High Street, Thornbury on Saturday September 24th from 5pm to 7pm. The band “Breakout” will have a guest drummer, so we should swing like the clappers, as the saying goes. And the bar serves nice drinks as well. So come along for a jazzy evening with our quartet. So Who Goes to Jam Sessions these days?